Compare prices from several car hire companies in Gran Canaria and find the best price for car rental. Our prices always include unlimited mileage and insurance. Gran Canaria has a population of over 800 000 (2009), which makes the island the second most populous island in the Canary Islands. Gran Canaria is the third largest island in area and located with the rest of the Canary Islands off Africa’s northwestern coast. 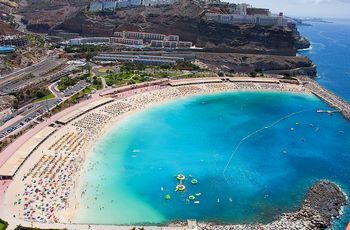 Gran Canaria has a lush vegetation and white sandy beaches, and has since the 1960s been an established holiday destination. As the tourist crowd grew, it was erected artificial cities which today are typical tourist sites. The main town called Las Palmas de Gran Canaria, also just called Las Palmas, and each year held Carnival of Las Palmas is a world-renowned festival. Gran Canaria Airport is the busiest airport in the Canary Islands and is situated approx. 20 km outside Las Palmas.